Bod Luis Alegre [Rioja Alavesa] - VINOS LIBRES "just honest wines"
Bodegas Luis Alegre is situated in the heart of the Alavesa region of Rioja near the town of Laguardia, the regional capital. It was founded by Don Luis Alegre in 1968 - in the late '90s he was joined by a group of Spanish wine enthusiasts dedicated to quality and to sustainable winemaking. The winery's mission is to make high quality wines that respect the traditions of Rioja while embracing the best that new technology and techniques have to offer. In 2000 the new partners built an awesome circular winery set into the Hillside - the modern silo like structure was designed to use gravity to move fruit and juice at every stage of production and minimize handling. So grape receiving, fermentation, Barrel ageing and bottling are all on different floors – While a restaurant with a stunning view of Sierra Cantabria and Sierra de la Demanda - crowns the top of the winery. Great care is taken at all stages of wine making with emphasis on using only the best fruit – therefore Luis Alegre only harvests all fruit by hand and grape sorting tables are used extensively and are often transported into the vineyards during harvest. Oak is sourced from Vosges, Hungary and America and the freshly cut staves are brought directly to the Bodega to be dried over a period of 18-36 months. During this time the oak is subject to painstaking and unique analysis to ensure that the right oak is used with the right wine. be modern and elegant rather than ‘power wines’Quality is the guiding principle for everything the winery produces. Beginning with meticulous care for the vines, continuing with selection of the highest quality fruit, and finishing with a beautiful bottle of wine, Luis Alegre produces some of the highest quality wines in the Rioja region. The wines are both modern and elegant. 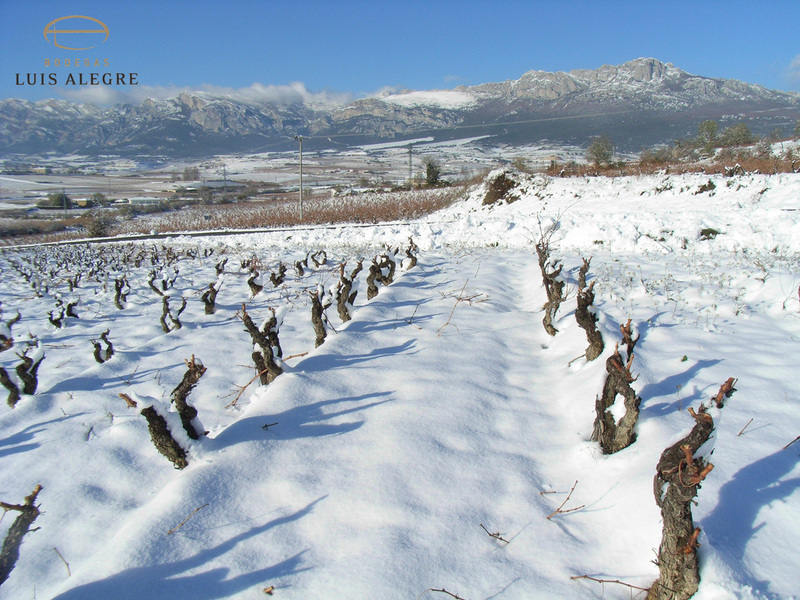 YES it snows in Rioja Alavesa... as it does in Burgundy! Luis Alegre Vineyards are dry-farmed but melting snow seeps deep into the soil creating moisture that sustains ancient vines that reach a depth of 12ft+ - in the heat of summer. The Rioja area is subdivided into three regions - Rioja Alavesa, Rioja Alta and Rioja Baja. La Rioja Alavesa and la Rioja Alta, located closer to the mountains, are at slightly higher elevations and have a cooler climate. La Rioja Baja to the southeast is drier and warmer. Annual rainfall in the region ranges from 12 inches (300 mm) in parts of Baja to more than 20 inches (510 mm) in La Rioja Alta and Alavesa. Many of Rioja's vineyards are found along the Ebro valley between the towns of Haro and Alfaro. Despite sharing a similar climate as the Alta region, the Rioja Alavesa produces wines with a fuller body and higher acidity. Vineyards in the area have a low vine density with large spacing between rows. Luis Alegre "selection de robles europeos"
This wine is produced at a single plot, which is 85 years old, with an altitude of 650 meters, and a very limited yield, and this allows us to produce one of the most charismatic whites within our Denomination of Origin, given that these white grapes are also carefully sorted at our Selection Table. It ferments for about 6 months at a temperature up to 20 degrees Celsius which is controlled in each oak cask, with a cooling system that allows us to “work” each cask separately. Very limited production of 15-20 casks per year. Serving suggestion: given its aging in casks it is suited to accompany white meat, all kinds of rice, and light and fatty fish. Age of vineyards: 85 years. Cask type: 100% new French, Hungarian and Croatian. Grape varieties: 90% Malvasia, 10% Viura. Colour: clean and bright. Straw-like with greenish iridescence on the meniscus. Nose: at glass stop, citrus notes come forth together with sweet nuances of ripe yellow fruit, blended with hints of vanilla. When turning the glass, tropical fruit nuances are appreciated (Pineapple, Peach, Apricot), with a background of pastry and roast-scented notes, which are both fine and elegant. Palate: it emerges as stylish and fresh, with a remarkable smoothness. A great balance between fruit, acidity and alcohol has been attained. Long aftertaste distinguished by thin roast-scented notes. KODEN: 100% Tempranillo that ages in new French oak for 6 months. A pure expression of Alavesa fruit with just enough oak to give it balance and depth. A young, but mature, red wine that stands up to any Crianza. BLANCO: 100% Viura. No oak, but the juice rests sur lees for 3 months, which gives this wine a beautiful creaminess and wonderful finish. The grapes are produced at a range of vineyard plots property of the winery that are the home to a strongly-selective viticulture, controlled exclusively by the Bodegas Luis Alegre Technical Team, that is very demanding about fruit quality. The structure of this great wine is the result of a good mixture of Tempranillo variety grapes, blended with a selective sample of Rioja red grapes: soft and mellow Mazuelo, red and juicy Grenache, and strong Graciano from old vines. Serving temperature: between 16 and 18ºC. It is an ideal accompaniment for red meat (steak) and soft meat (lamb). Age of vineyards: 35 and 40 years. Type of cask: 80% American and 20% French, both new and semi-new (less than 5 years). Time in cask: 17 months. Grape varieties: 90% Tempranillo, 10% Garnacha, Graciano and Mazuelo. Colour: intense red colour, clean and bright. Nose: an aroma of ripe fruit that is both intense and clean; a background of vanilla, cinnamon, and tobacco fragrances as a result of ageing in wooden casks. Palate: meaty and very balanced. A flavour of spices and ripe fruit, which is clean and mouth-filling, thanks to its 19 months of ageing in the bottle. It has a good mid-palate taste, and a long finish. Presentation: in cardboard boxes containing 6 bottles. Selection to achieve perfection. The wine is solely produced in years in which the exclusivity of a good wine will be truly achieved. This is paramount for us and our consumers demand this as well. Throughout the winter, thorough wine-growing techniques are employed. This careful process involves selective pruning, constant ploughing to oxygenate the soil, a total absence of treatments which are aggressive towards the environment and a very limited production ceiling, which is as low as 1.20 kg per vine. From these painstakingly treated kilos (about 20,000 kg), we then isolate the best 9,000 kg at our selection tables. Wines are made in two tanks made out of French Allier oak with a low volume capacity (5,000 kg), in order to ensure perfect control over temperature and fermentation development. The wine is aged in a selection of superfine grain oaks from several European countries (including France, Hungary, and Slovenia). Serving suggestion: Hearty red meat, roasts and big game. It can also be an excellent replacement for after-dinner spirits. Soil type: chalky and stony. Barrel type: 100% new French oak. Time in cask: 14 months. Grape varieties: 95% Tempranillo, 5% Graciano. Colour: intense cherry, with ruby-like hints. No rim variation. Very clean. Nose: a complex aroma. A distinct ripe fruit fragrance, with a black fruit and compote scent, blends in perfectly against the wood backdrop, containing hints of black pepper, balsamic and very mineral notes, with the highlights being the quality of the timber and the fine and elegant tannins. Palate: powerful and full-bodied, tannic but well-balanced, with elegant and subtle tannins. Its potent structure brings it a high ageing power. Long and persistent. Production: 8,000 bottles when produced.